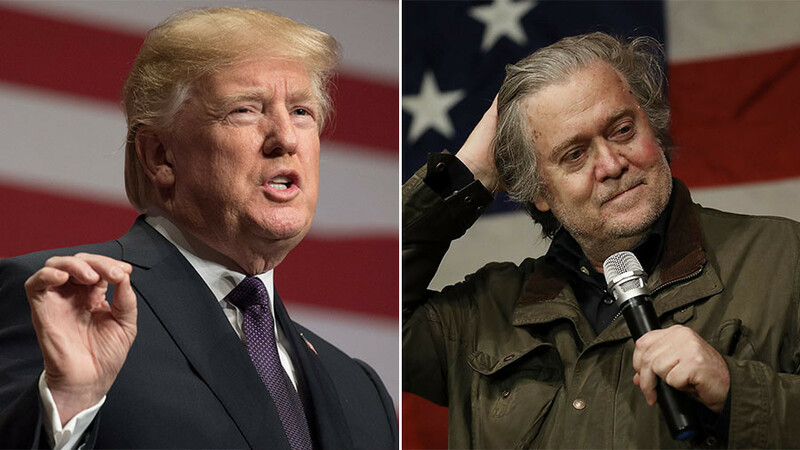 Donald Trump lashed out at his former chief strategist Steve Bannon on Wednesday, accusing him of having “lost his mind” after the one-time aide made explosive accusations against the president and his family in a new book. “Steve Bannon has nothing to do with me or my presidency,” Trump said in a statement released by the White House. Bannon was chief executive officer of the Trump campaign in its final three months and then White House chief strategist for seven months before returning to the rightwing Breitbart News. According to Fire and Fury: Inside the Trump White House, Bannon told author Michael Wolff the Trump Tower meeting between the president’s son and a group of Russians during the 2016 election campaign was “treasonous” and “unpatriotic”. He also reportedly made a range of claims about the likely targets and results of the investigation into Russian election meddling by the special counsel Robert Mueller. In the book, which was obtained by the Guardian ahead of publication from a bookseller in New England, Wolff paints a picture of a White House in chaos, locked in internecine warfare with even some of Trump’s closest allies expressing contempt for him. In his statement, which was issued after New York magazine published its own extensive excerpt of the Wolff book, Trump said: “Steve pretends to be at war with the media, which he calls the opposition party, yet he spent his time at the White House leaking false information to the media to make himself seem far more important than he was. It is the only thing he does well. Wolff, a former Guardian columnist, told the Guardian in November that he had no agenda in writing the book but wanted to “find out what the insiders were really thinking and feeling”. He enjoyed extraordinary access to Trump and senior officials and advisers, he said, sometimes at critical moments. On Wednesday, one subject of conversations reported in Wolff’s book, billionaire Trump ally Tom Barrack, told the New York Times he had not made a reported abusive remark about the president. Steve Bannon at the Conservative Political Action Conference in February 2017. The White House press secretary, Sarah Sanders, said in a written statement that the book was “filled with false and misleading accounts” and was “trashy tabloid fiction”. Sanders claimed that Wolff had “never actually sat down with the president” while researching the book but just had “one brief conversation” of about five to seven minutes. She was also aware of just over a dozen interactions between Wolff and White House officials, “95%” of which were at Bannon’s request. “I know the book has a lot of things that are completely untrue,” she claimed. Stephanie Grisham, communications director for the first lady, rejected claims in the book that Melania Trump cried when her husband won the presidency. Donald Trump Jr also jumped into the fray, blasting Bannon in a series of tweets that blamed him for the election of the first Alabama Democrat elected to the Senate in more than a generation. “Thanks Steve. Keep up the great work,” Trump Jr said, replying to a reporter’s tweet about the swearing-in ceremony of Doug Jones. Bannon declared a “season of war” on the Republican establishment and has threatened to run disruptive primary challengers against incumbent senators. The Senate majority leader, Mitch McConnell, said the Alabama special election, in which the controversial Republican Roy Moore, who was accused of sexual misconduct with teenage girls, lost to Jones, demonstrates that Bannon’s anti-establishment candidates are unelectable. After Trump released his statement on Bannon, McConnell’s re-election campaign account tweeted a gif of McConnell grinning.